by Ron Holland and Walter Ashe, 2006. The city of Asheville had four naval warships named in its honor during the twentieth century. 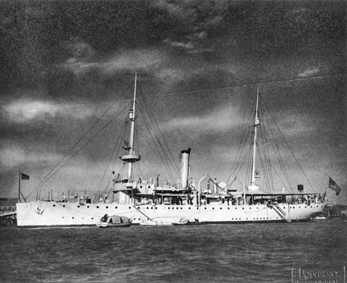 The USS Asheville (PG-21) was the first warship built at the Charleston Naval Shipyard in Charleston, S.C. Launched on 4 July 1918 and commissioned on 6 July 1920, the vessel's assignments included duty in the Caribbean and the Pacific, with a considerable amount of time spent patrolling Chinese waters, particularly during 1932-40. In the late 1930s author Richard McKenna, later a resident of Chapel Hill, served on the PG-21, where he was introduced to various accounts of the Chinese Revolution (1925-27) that he incorporated in his nationally acclaimed book The Sand Pebbles (1962), which was made into a motion picture in the mid-1960s. In December 1940 the PG-21 was sent to the Philippines for inshore patrol at Manila, but by May 1941 it was back in Chinese waters. After experiencing engine trouble in early July, it was towed to the Philippines for repairs. Following the Japanese attack on Pearl Harbor on 7 Dec. 1941, the USS Asheville and its sister ship, the USS Tulsa, were ordered to proceed to Java. On 27 Feb. 1942 the Japanese won the Battle of the Java Sea, and on 1 March the Asheville and the Tulsa were ordered to Australia to seek refuge from an overwhelming enemy force. A number of ships, including the Asheville and the Tulsa, were to rendezvous 500 miles south of Tjilatjap, Java. The two ships were spotted by the Japanese on 2 March, prompting them to part company. The PG-21, once again experiencing engine trouble, continued to the rendezvous point, hoping to join other ships of the Asiatic Fleet for protection. But the Japanese had detected the order to rendezvous, and two destroyers and one cruiser were lying in wait on 3 March. Within 30 minutes they sank the PG-21 in 2,700 fathoms of water. Only one survivor, Fred Brown of Fort Wayne, Ind., was picked up by the Japanese, presumably to identify the sunken ship. Brown was held in a Japanese prison camp until his death from pellagra, heart trouble, and dysentery in March 1945. The only details of the sinking of the PG-21 were recounted by another prisoner of war who heard them from Brown before he died. At a ceremony held on 7 Sept. 1942 in the Asheville City Auditorium, 160 men enlisted in the navy-enough to replace the crew lost at sea. The second USS Asheville (PF-1) was constructed by Canadian Vickers, Ltd., of Montreal. It was part of the Lend-Lease program and was originally named HMS Adur. Taken over by the United States during construction, the ship was launched as the USS Asheville on 22 Aug. 1942 and commissioned on 1 Dec. 1942. The PF-1 was initially assigned to the Eastern Sea Frontier, escorting convoys between New York and Guantanamo Bay, Cuba; during the winter of 1943-44, it patrolled the waters off Cape Hatteras. After a refitting in Boston, the PF-1 took part in antisubmarine warfare experiments at Quonset Point, R.I., and Port Everglades, Fla. It served as an experimental radar ship during its final phase of duty and was decommissioned at the Norfolk Navy Yard on 14 Jan. 1946. The third USS Asheville (PG-84) was a patrol gunboat constructed by the Tacoma Boatbuilding Company of Tacoma, Wash. Launched on 1 May 1965 and commissioned on 6 Aug. 1966, the PG-84 was assigned to South Vietnamese waters in May 1967. As part of the coastal surveillance force, it provided gunfire support for the U.S. and South Vietnamese armies and blockaded the coast in an attempt to cut the flow of arms and supplies to the North Vietnamese. Although the ship's involvement in Vietnam ended in December 1972, it remained in the central and western Pacific until June 1974. 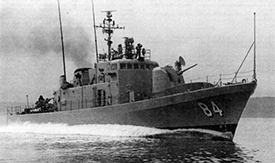 The PG-84 spent the rest of its active career on the Great Lakes as a training platform for Naval Reserve personnel. It was decommissioned on 31 Jan. 1977. 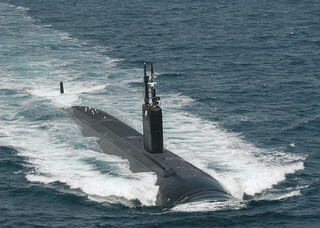 The fourth USS Asheville (SSN-758) is a nuclear attack submarine constructed by Newport News Shipbuilding, with parts manufactured by its subsidiary, Asheville Industries, located in Arden, a suburb of Asheville. Launched on 5 Feb. 1990 and commissioned on 28 Sept. 1991, the SSN-759 is equipped with vertical launch cruise missiles, 21-inch torpedo tubes, an advanced combat control system, a satellite direction-finding system, retractable bow planes, and a hardened sail. These features enable the ship to function in every ocean in the world, including the icy Arctic and Antarctic waters. It continues to serve as a memorial to the sailors who died on the first USS Asheville at the beginning of World War II. "Archives and History Staff Help Move Exhibit to Permanent Home." Carolina Comments 53. No. 2. April 2005. p. 47. http://digital.ncdcr.gov/u?/p249901coll22,208002 (accessed October 11, 2012). The USS Asheville, ca. 1937. Courtesy of Walter F. Ashe, Asheville. Nash, W.M. "Asheville(PGM-84), lead ship of a new class of fast combatants, underway, 6 August 1966, in this view taken by Photographer 1st Class W. M. Nash." August 6, 1966. Dictionary of American Naval Fighting Ships. Naval Historical Center, Department Of The Navy. http://www.history.navy.mil/danfs/a12/asheville-iii.htm (accessed October 11, 2012). Peterson, Thomas C./U.S. Navy. "030729-N-5465P-003" San Diego, Calif. November 29, 2008. Image from Flickr user Marion Doss. http://www.flickr.com/photos/ooocha/3069250297/ (accessed October 11, 2012).